Dallas Estate Sellers (Stephen and Jose) are – without exception – THE ABSOLUTE BEST in the business. We cannot recommend them highly enough. We have now trusted DES to handle TWO sales – the first for my father, and the second for ourselves, as we downsized. When you are asking someone to handle family possessions that may hold years of memories, you want someone who is respectful of your sentiment. You also want someone who will be honest about the difference between your sentimental value and a dollar value. They will ALWAYS be honest with you in every step of the process. They go way beyond what other estate sale companies do – not only are they professional and respectful of your personal items, but they will spend the necessary effort to stage your home in order to maximize the visibility of what you have, and to show it off beautifully! Their staff is equally professional and kind. Perhaps most importantly, Stephen and Jose, and their great crew, are 100% trustworthy in handling the sale and caring for your home. In this business, they don’t get any better than Dallas Estate Sellers! As an estate sale shopper, I had noted which companies had plus and minus ratings based upon my own experiences at their respective sales. When it came time to have our own due to downsizing and life change, I knew immediately with whom to turn for this emotional and stressful job. Within 24 hours of the phone call, Jose and Stephen were in our home providing all the assurances we needed to sign on the dotted line and set the dates. We knew they were the right ones to represent and sell our possessions. The care, creativity and transformation with which they and their crew worked to prepare for the sale was amazing. They treated the items, many of which we treasured for years, with respect and even interest. Jose and Stephen truly made this phase of our journey as easy as possible and always provided the assurances we needed to know that the sale was in excellent hands. Thank you and your staff for providing us with an excellent experience; we are indeed proud to recommend your services! I have personally worked with both Stephen and Jose for over 6 years and they hit the mark on all levels. If you want professional, personal and above and beyond service look no further. I would never hesitate to recommend their services. I love Dallas Estate Sellers they will take care of you like family. Dallas Estate Sellers gets top results for their clients while providing value for their buyers. They beautifully display, photograph and advertise all items to be sold to attract new and returning customers. Their knowledge and research assure that special collections and treasures are identified and priced appropriately. 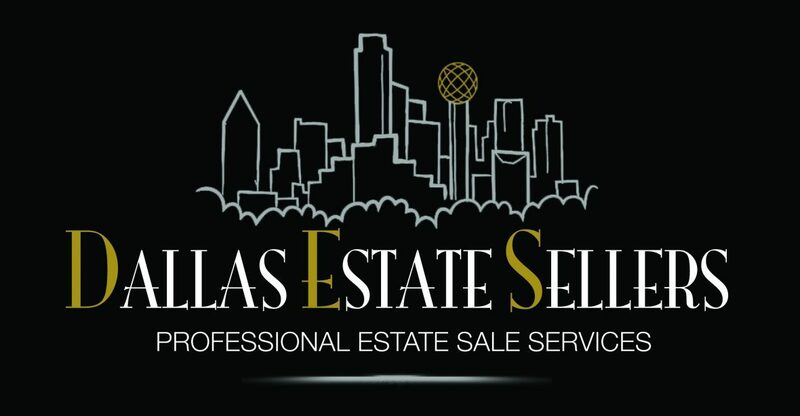 As someone well acquainted with most of the estate sale companies locally, I consider Dallas Estate Sellers to be the absolute best! I happily would hire them again or recommend them to others. I look forward to their emails and continue to shop their sales. How to capture Jose and Stephen and the team in a review – they are professional, they love what they do, they are very talented merchandisers – they know how to display items, they moved furniture from one room to the other with fantastic results. Their merchandising skills resulted in exceeding my expectations in sale proceeds. We had a lifetime of memories (50 years) / belongings – for us it was overwhelming to sort through / organize. Jose and Stephen were compassionate, they took ownership of the process. It is my belief that our mom would have been overjoyed in how well they displayed her jewelry, hats, collectibles. I had friends who used them for a large estate in Highland Park – they highly recommended Jose and Stephen and I am grateful to them for their recommendation. In closing – Honesty, Integrity, Responsiveness, Compassion / Care – these are people you want to help you when you need to traverse this process. They went above and beyond in many ways – they know their business, again they love what they do – they care for you and your belongings – thank you Jose and Stephen and your team – job well done! I cannot say enough good things about this Company! When we decided to downsize and move I was extremely hesitant about selling most of our belongings. After interviewing José & Stephen with the DES Team we knew they were the ONE for us! Professional, knowledgeable, kind, sincere, hard working and fast! The entire Team was simply wonderful! You won’t go wrong when you choose this company! I can’t say enough about the service you will get when you use these amazing people for your Estate Sale! They go above and beyond to sale your belongings and they have much respect for your feelings during the sale from start to end. I have used them and would use them again. I just love them! Occasionally someone comes along that makes you redefine something you thought you knew. We thought we knew about the term, “above and beyond”. You guys redefined that term for us in the last two weeks! We are so grateful for you to take us on at the last minute and made our sale such a huge success. You also have the best staff on the planet! Each one worked so hard, yet kept the best attitude. Thank you both! they live and breathe “service”..
Have you ever wondered what happened to Service? You know, the experience of having someone come up to you at a store and say “May I help you?” While smiling? No? How about hiring someone to do a job for you and not only will the people you hire do an excellent job, but they will do it in the time allotted and gladly. No? Well, you’re in for a pleasant experience when you engage Jose and Stephen to handle your estate sale. They live and breathe “Service”. They enjoy giving you the best service they can. How do I know this? They took care of my estate sale before I closed on the sale of my home in Dallas, Texas. Not only did they stage my home – which I thought was something Hercules might have passed on, but Jose and Stephen turned it into a show place – and they got me top dollar for the items I wanted to sell. And, after the estate sale, they cleaned up the house. It was immaculate. I was thrilled. That is “Service” folks and that’s what you will enjoy when you hire them. And, they smile..